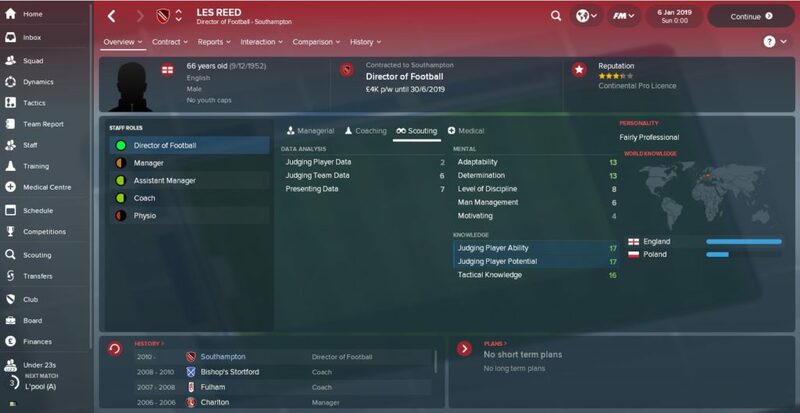 No matter what level you start at on Football Manager 2018, it’s imperative that you get your recruitment right. The best way to achieve this is to ensure that your scouting department is working effectively to provide you with accurate reports on potential targets. Upon joining a new club on FM18 one of your first priorities should be to evaluate the staff you’ve inherited and decide who to keep and who to get rid of. It’s a cruel world, football. If any of the scouts in your recruitment department aren’t up to scratch, you should terminate their contract straight away and bring in your own staff members. As a general rule of thumb, you should look to hire scouts with attributes of ’15’ or higher for either or both ‘Judging Player Potential’ and ‘Judging Player Ability’. A good reputation is also desirable too. You should always have a full complement of scouts and data analysts in your recruitment team and if you’re light on numbers, have a word with the chairman and get him to increase your allocation. When it comes to signing scouts, you should look to have as diverse a team as possible. 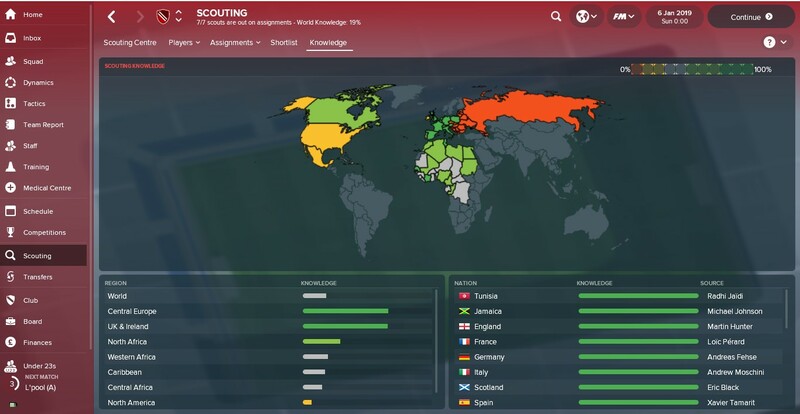 Possessing scouts with a broad knowledge of a nation or region will enhance your club’s world knowledge, boosting the number of players that appear on a new search. Sending your army of scouts across the world without giving them any guidance as to what you’re looking for is a waste of everybody’s time. If your scout recommends signing Neymar and you’re managing Southampton, it’s not particularly useful. You need to work with your scouts if you want to discover a player that can make a difference for your team and the way to do that is to give them specific assignments. The more specific you make the scouting assignments the higher the likelihood that your scouts will find someone that fits the profile you’re after. Generally speaking, I advise my scouts to monitor players aged 24 or under, send them to a nation or region that they have high knowledge of, and set a budgetary limit for a potential transfer. Another important factor to consider is a player’s attributes. If you’ve got a team that plays a high-intensity style of football, it is likely that any future signing will need to possess the stamina and work-rate to get around the pitch. Mental statistics are worth looking at too, particularly given the introduction of Dynamics on FM18 which has given players more complex personalities than ever before. If you happen to have an ambitious squad whereby the majority of the players get on well and work together, you’d be wise not to unsettle things by bringing in a temperamental player that could rock the boat. Anyone who has read Michael Calvin’s excellent book The Nowhere Men will know that modern day scouting is a blend between the old and the new. There are the old school scouts who have an eye for talent and travel far and wide in an attempt to find the next big thing but increasingly, analytical scoutings tools are being used by clubs too. 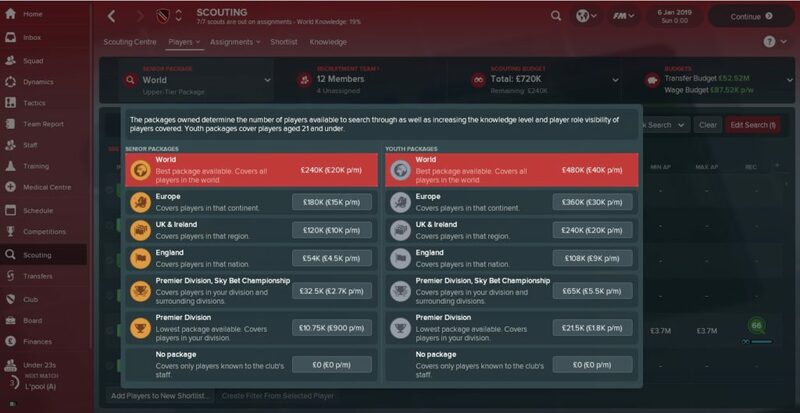 On FM18, you’ll notice that there is a new element to scouting in the form of a ‘Scouting Package’ and you can upgrade or downgrade your club’s package however you see fit. Essentially these packages are a Football Manager version of real-life scouting tools such as Instat or Wyscout which are huge databases containing analytical information about thousands of players. Upgrading your scouting package is definitely beneficial as it enhances the number of players you can find on the player search menu while also revealing what their best roles are on the pitch. Furthermore, as having a scouting package will increase your knowledge of a particular player, it means that it takes less time to get a data analyst’s report on them, speeding up the overall process. It isn’t the glitziest new feature on FM18 but it’s certainly useful. Directors of Football are still viewed somewhat suspiciously in England, largely due to high-profile failures in implementing the system properly. Sure, Frank Arnesen flopped rather badly at Spurs and Chelsea but there are plenty of examples of DoFs or Sporting Directors working wonders on a club. Just look at how revered Monchi was at Sevilla, for instance. Les Reed has played an important role in Southampton’s success in recent years. With so much to keep track of on FM18 sometimes it’s useful to delegate certain tasks to other staff members and if you have a good DoF, you can lean on them for a helping hand. 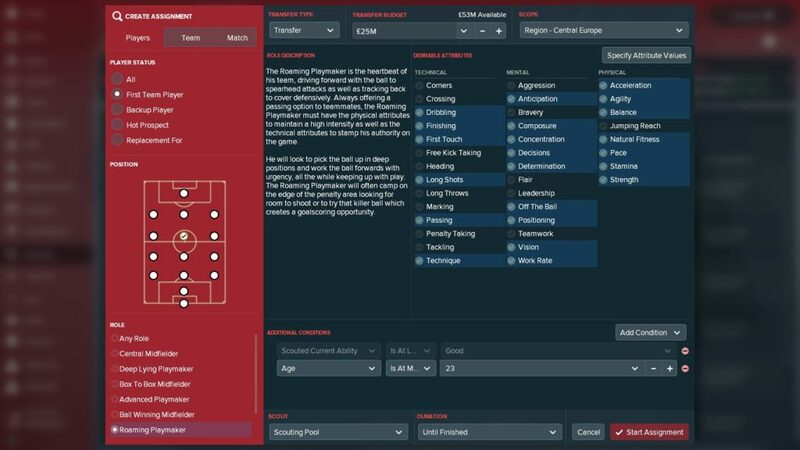 When it comes to Scouting, DoFs can set assignments for scouts and provide regular reports on the players they find, which makes your job a whole lot easier in the lead up to the transfer window.